Machine-gun bacon sounds like a continental breakfast menu item at the NRA convention. Instead, it’s the subject of a video featuring Republican presidential candidate and U.S. Sen. Ted Cruz (R-Texas), who, after wrapping bacon around the barrel of an AR-15 semiautomatic rifle, cooks it to ammo-crisped perfection using the heat of his shooting. 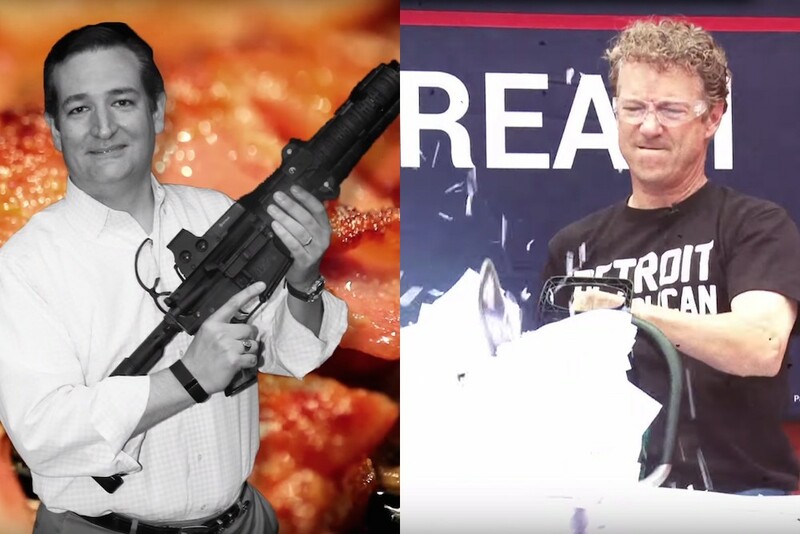 Sen. Cruz isn’t the only candidate who fired off a weaponized YouTube video in recent weeks. Sen. Rand Paul (R-Kentucky) uploaded a video in which, using fire, a chainsaw, and a wood chipper, he destroyed the 70,000-page U.S. tax code. And Sen. Lindsey Graham (R-South Carolina) used a sword, cinder block, and blender, among other weapons, to destroy his cell phone in a video after fellow candidate Trump announced Graham’s cell phone number during a campaign rally. Which brings us back to O’Donnell’s original question: Would these outrageous videos exist if the candidates weren’t playing catch-up to such an outrageous candidate? With 17 candidates, the Republican primary field is so large that tonight’s Fox News debate will be split into two parts, forcing nationally recognizable politicians like Texas Gov. Rick Perry and Louisiana Gov. Bobby Jindal to woo voters at 5 p.m. instead of at 9 p.m. with the top 10 candidates. And of the 17 candidates, Trump has stood out. Early polls reflect that, with Trump holding a double-digit lead over the second and third place candidates, former Florida Gov. Jeb Bush and Wisconsin Gov. Scott Walker, in most surveys. Though no major publications give Trump any chance of winning the nomination — one writer on election forecasting website FiveThirtyEight.com projected his chances at a very unscientific -10 percent — the media can’t stop covering him. Google Trends shows how frequently Trump is mentioned compared to other candidates. By grabbing headlines when candidates like former Virginia Gov. Jim Gilmore and former New York Gov. George Pataki are fighting for air, Trump has trumped the opposition. When the U.S. announced a recent nuclear deal with Iran, each candidate looked to condemn it in the most vehement way possible. Cruz said that “the Obama Administration will become the leading financier of terrorism against America in the world”; Graham called it “a death sentence for the State of Israel”; former Arkansas Gov. Mike Huckabee said the deal was “marching Israelis to the door of the oven,” a statement he stood by even after criticism from Jewish groups. It doesn’t matter that Trump is in the headlines for doing things like calling Mexican immigrants rapists or ridiculing Rick Perry for wearing glasses to look smart and Lindsey Graham for polling at zero percent in under a minute — Trump is talking, America is listening, and everyone else is playing catch-up. But can Trump’s early lead be directly correlated with the subsequent attention-grabbing candidate videos? Graham and Cruz’s videos were both produced by the Independent Journal Review, a site that has been called the “Conservative Upworthy.” In comments to BDCwire, IJ creative director Benny Johnson — who previously worked at BuzzFeed before being fired for plagiarism — said that the videos reflected the appetites of new media consumers. Johnson also said that Trump has not had an effect on their videos or their content, and promised more would be coming soon. The concept of reaching audiences through newer digital platforms isn’t exclusive to Republicans, either. When President Obama looked to encourage young people to sign up for health insurance coverage through the Affordable Care Act, he appeared on Funny or Die’s talk show “Between Two Ferns” and made a video with BuzzFeed full of mirror poses and selfie sticks. These moves make sense. In terms of traffic, BuzzFeed and IJReview rank 36th and 64th in the U.S., respectively, according to web traffic company Alexa. Some forecasters are even taking a strong digital presence and engagement with social media into account when looking for signs of a successful campaign. An opinion piece by Grant Nicholas in The Boston Globe raises a similar point, hypothesizing that because 64 percent of Americans now own smartphones, the emphasis on digital campaign techniques is analogous to the rise of television in the 1960 election. The last time this kind of technological shift occurred, it had a profound effect on the electoral process. In the decade leading up to the 1960 election, the percentage of American households with a television jumped from 11 to 88. John F. Kennedy took advantage of this shift in the first televised presidential debate: Famously, those who heard the debate on the radio thought Nixon won, while those who watched on television favored the more dashing Kennedy. In all likelihood, we’ve reached a tipping point where social and digital are major components for any politician to secure voter attention. Circling back to O’Donnell’s original question, Maddow reaches the same conclusion. This article has been updated to include Benny Johnson’s response to a request for comment.